As you know, the story of Mata Nui has ended, and Lego has gone back in time to the ancient island city of Metru Nui. Of course, the heroes are still based on the same six elements: air, stone, earth, ice, fire and water. 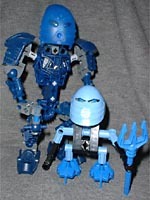 Toa Metru of water and guardian of Ga-Metru, Nokama is respected by all for her ability to use logic to settle disputes. She could be a strong leader herself, but prefers to support Vakama, for she believes in his courage and the power of his visions. Nokama can often be found using her twin hydro blades to speed through the protodermis canals. She is intelligent and strong, but sometimes does not listen to others as much as she should. The Toa Metru have a drastically different construction than the heroes we've seen before - while the Toa and Toa Nuva shared the same torso, the Toa Metru have fully new bodies, larger and much more poseable than before. Lego's Bionicle line just keeps getting bigger. Yes, there are ever-increasing numbers of sets and more fans all the time, but that's not what I mean: the actual toys are larger. The original Toa were about 6 1/2" tall, but the main characters keep stepping up in size so that we now have 8" Toa Metru. And yet she was the little tiny Turaga in the original line? It seems that Nokama is just like your grandma: she shrank as she got older. Last year the Rahkshi became the first Bionicle figures with knee joints, and now the Toa Metru add elbows. The original set of six moved only at the shoulders, hips, ankles and wrists, and while Nokama maintains all those joints, she also has a balljointed neck, making her one of the first Toa who can look side to side. Nokama's body, like all the Toa Metru, is a brand-new style. While it's closer to the Throwbot and Roboriders that preceded this line, the new scaffolding-like body seems to have lost the "Bio" part of the "Bionicle" name. 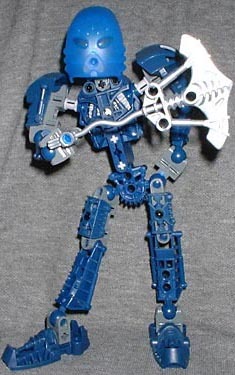 Gali, the original Toa of water, had two gears in her shoulders to allow both arms to swing; a rarity, since most of her companions only had one. Now that all the Toa Metru have this double-armed capability, Nokama just doesn't seem as special. To help fight off the plant plague that is threatening her island home, Nokama comes with a pair of odd-looking axes - her hydro blades. 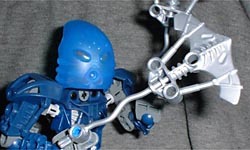 The description above mentions that she uses them to swim through the protodermis canals; Bionicle author Greg Farshtey has said that there is no water in Metru Nui, only the liquid protodermis, which raises some questions. If there's nothing but protodermis, why is Nokama the Toa of Water? And for that matter, where did the ice of Ko-Metru come from? The hydro blades are strange accessories. They have an aquawing look, sort of like a manta ray on a leash, that goes well with Nokama's watery element, but they're still odd. The wavy strand that connects the axes to Nokama's hands seems superfluous, like the blades would have been better as short, hand-held weapons. I can't imagine those thin pieces of plastic holding up well to any rough play, and the way they attach to the backs of her hands is just weird. The blades can be stored on her back when not in use. 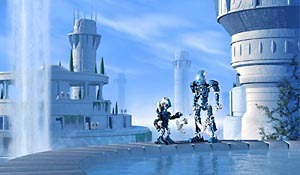 Nokama oversees the southside district of Ga-Metru, the primary spiritual and learning center of the Matoran. Teachers, students and athletes reside in the shadow of the Great Temple, which honors the spirit of Mata Nui. Truly talented students are taught to purify protodermis, in preparation for turning it into kanoka discs. Since the Bionicle story is not focused on collecting masks any longer, Nokama's kanohi plugs quite securely into her face. I really adore the design of the mask, which looks like nothing so much as a giant bubble. There are a few bumps (scales?) and ridges (gills?) on the surface and, out of all the Metru Kanohi, the Rau bears the closest resemblance to its later form. In her days as Turaga of Ga-Koro, Nokama's mask of translation gave her the ability to understand any written language - as a Toa, she can also communicate with the rahi, or wild animals, of Metru Nui. The color of these sets has been a bone of contention among Bionicle fans: some like getting four (five if you want to get technical) new colors of pieces, while others complain that the new colors are ugly and can't be mixed with the old parts. Nokama's body is a nice dark blue, while her mask is lighter. Oddly enough, the new Rau matches Gali's body construction, while Gali's old Kaukau is closer to the new dark blue. 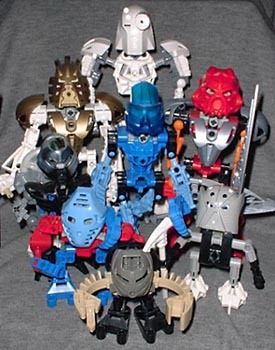 I wasn't crazy about the Toa Metru when they were first revealed: beyond the weird scaffolding bodies, they all looked like the same construction; the original Toa had variety in their construction that helped sell their personalities, but the Toa Nuva wiped that out. However, the Toa of Metru Nui have more variety than it might seem, and the new poseability gives them more play value than any Bionicle sets before. Nokama and the rest of the Toa Metru have won me over. Who's got the coolest mask? Tell us on our message board, the Loafing Lounge.